Imagine waking up to the sound of waves crashing against the surf or strolling through soft, white sand right outside your front door. What could be better than ocean-front living? How about ocean-front living without the worries of home maintenance? Or, better yet, ocean-front living amid luxurious amenities that make every day feel like a five-star vacation? Beach-front condos offer all that and more, making them the perfect choice for savvy buyers seeking a primary home, vacation home or investment property. Condos located on prime seaside real estate provide homeowners with all the benefits of a waterfront home without the hassles, along with an almost guaranteed return on the investment. The Southeast shoreline is a choice area for seaside real estate. From the isolated, natural beauty of North Carolina-s Outer Banks to the hustle and bustle of metropolitan Miami, condo development and condo sales are booming. It-s a trend the National Association of Realtors believes will continue, especially along the coast, where population is expected to continue to rise dramatically in the coming years. "We hadn-t had any new condo projects in the last decade," says Richard Hess, vice president and general sales manager of Sun Realty in Cape Hatteras, North Carolina. "But right now, we have three new ones coming in. Two of them are new construction and one is a conversion." "We-ve had a lot of conversion activity here," Bradley Bennett, broker-incharge at OceanfrontGuru in Myrtle Beach, South Carolina, explains. "This is an area where people want to be." With the limited availability of ocean-front property, developers up and down the coast are converting hotels, rental units and even retail space into condominium complexes to meet the rising demand for beachfront condos. Among those flocking to the shore are baby boomers looking to own a piece of paradise. In addition to the expendable income that makes second-home ownership possible, many of them also have the affluence that allows them to purchase a lifestyle as much as a residence. Condo ownership makes that lifestyle more affordable than buying a single-family house. Ocean-front real estate is always at a premium, so it-s no surprise that the amenities available in condo developments at or near the beach generally are equal to or better than those found in upscale single-family neighborhoods. In addition to the pools, fitness centers and tennis courts commonly associated with condos, communities lure buyers with boat docks, on-site guest suites, professionally decorated clubhouses, scheduled events, security gates and security staff. Buyers looking for the ultimate in fringe benefits need look no further than the opulent condo hotel developments sprouting up along the coast. Many are of four- and five-star quality and are attached to trusted franchise names. Owners might enjoy full-service spas, maid and concierge service, fine dining and other perks. "Amenities sell," says Bennett. "The buildings with the most activity are the resort-style buildings with lots of amenities and other conveniences. They rent better and sell faster, especially those with better upgrades." While a conversion once meant little more than sprucing up the lobbies and hallways, coastal developers now are more likely to go with luxury upgrades such as granite counter tops, designer fixtures and window treatments, stainless steel appliances and ornate décor. Amenities aren-t the only upside to a beach-front condo purchase. Sharing responsibility for costs associated with exterior maintenance and insurance, landscaping, sewage, water, pest control, trash pickup and other operating costs makes condos an affordable ocean-front option. "Instead of a single-family home, more people buy a condo to avoid the time and cost of outside maintenance," says Jeff Scott, president of Scott Team Realty in the Outer Banks. "People see the value of having an association to take care of the property." Condo owners can get their exercise at the fitness center as opposed to mowing the lawn, and they can unwind by the pool instead of cleaning it. And people purchasing a second home have the peace of mind of knowing an association is there even when they aren-t. "A condo doesn-t have all the expense of a house, especially a big house," says Hess. "Often, when people buy a house, they need to rent it out to maintain it. 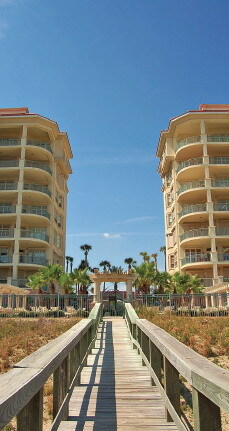 That-s not necessarily so with a condo, especially in our area, where beach-front property is more affordable." Ocean-front property can be costly; however, there are areas where it-s still comparatively reasonable. "This area is still relatively affordable," says Jennifer McCoy of RE/MAX Surfside Properties of the Cape Canaveral and Cocoa Beach region of Florida. "I-m seeing a younger crowd that wants second homes, people in their 30s and 40s." Condo owners often have the option of renting out their property, which can bring them rental income as well as appreciation. Beach destinations are among the most popular vacation spots so there-s no shortage of tourists looking for a home for a week. "About 80 percent of our beachfront condos are investments," says Bennett. "Most are on some type of rental program. 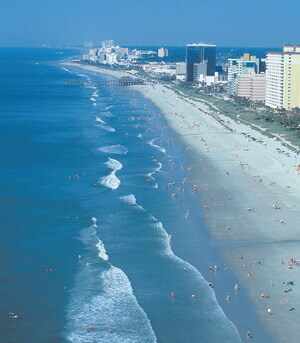 Myrtle Beach has a long rental season—a summer season from Memorial Day to Labor Day and spring and fall golf seasons." Other hot spots along the coast, such as Hilton Head Island, Fort Lauderdale and Miami Beach, see the same phenomena. The financial incentives of oceanfront condo ownership are not limited to potential rental income. Over the past four years, the rate of appreciation on condos has been nearly double that of single family homes—with condos in coastal areas increasing in value even more. "Ocean-front condos in the Outer Banks have shown quite a bit of appreciation," says Scott. "They-re still priced reasonably here, especially when compared to other resort areas." There-s little doubt that the demand for ocean-front real estate will continue to grow, which means prices will also grow. The southeast Atlantic coast offers moderate weather, year-round golf, water sports, boating and other outdoor activities and a wealth of beach-front condos that are perfect as homes, vacation homes or investments.